To better understand aircraft fuel systems and their operation, the following discussion of various components of aircraft fuel systems is included. There are three basic types of aircraft fuel tanks: rigid removable tanks, bladder tanks, and integral fuel tanks. The type of aircraft, its design and intended use, as well as the age of the aircraft determine which fuel tank is installed in an aircraft. Most tanks are constructed of noncorrosive material(s). They are typically made to be vented either through a vent cap or a vent line. Aircraft fuel tanks have a low area called a sump that is designed as a place for contaminants and water to settle. The sump is equipped with a drain valve used to remove the impurities during preflight walk-around inspection. [Figure 1] Most aircraft fuel tanks contain some sort of baffling to subdue the fuel from shifting rapidly during flight maneuvers. Use of a scupper constructed around the fuel fill opening to drain away any spilled fuel is also common. Sumping a fuel tank with a fuel strainer that is designed to collect the sump drain material in the clear cylinder to be examined for the presence of contaminants. Aircraft fuel lines can be rigid or flexible depending on location and application. Rigid lines are often made of aluminum alloy and are connected with Army/Navy (AN) or military standard (MS) fittings. However, in the engine compartment, wheel wells, and other areas, subject to damage from debris, abrasion, and heat, stainless steel lines are often used. Flexible fuel hose has a synthetic rubber interior with a reinforcing fiber braid wrap covered by a synthetic exterior. [Figure 2] The hose is approved for fuel and no other hose should be substituted. Some flexible fuel hose has a braided stainless steel exterior. [Figure 3] The diameters of all fuel hoses and line are determined by the fuel flow requirements of the aircraft fuel system. Flexible hoses are used in areas where vibration exists between components, such as between the engine and the aircraft structure. Exterior fuel hose wrap that protects from fire, as well as abrasion, shown with the clamps and pliers used to install it. As mentioned, aircraft fuel line fitting are usually either AN or MS fittings. Both flared and flareless fitting are used. Problems with leaks at fittings can occur. Technicians are cautioned to not overtighten a leaky fitting. If the proper torque does not stop a leak, depressurize the line, disconnect the fitting and visually inspect it for a cause. The fitting or line should be replaced if needed. Replace all aircraft fuel lines and fittings with approved replacement parts from the manufacturer. If a line is manufactured in the shop, approved components must be used. Several installation procedures for fuel hoses and rigid fuel lines exist. Hoses should be installed without twisting. The writing printed on the outside of the hose is used as a lay line to monitor fuel hose twist. Separation should be maintained between all fuel hoses and electrical wiring. Never clamp wires to a fuel line. When separation is not possible, always route the fuel line below any wiring. If a fuel leak develops, it does not drip onto the wires. Metal fuel lines and all aircraft fuel system components need to be electrically bonded and grounded to the aircraft structure. This is important because fuel flowing through the fuel system generates static electricity that must have a place to flow to ground rather than build up. 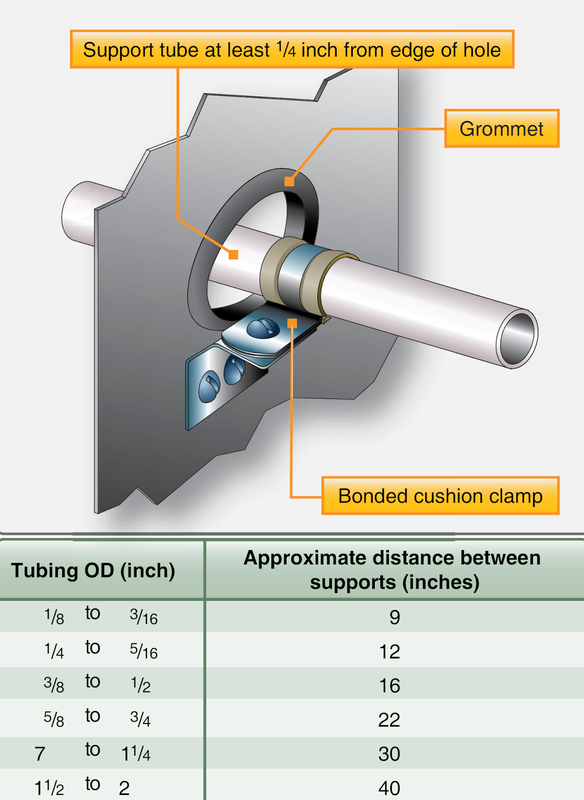 Special bonded cushion clamps are used to secure rigid fuel lines in place. They are supported at intervals shown in Figure 5. All fuel lines should be supported so that there is no strain on the fittings. Clamp lines so that fittings are aligned. Never draw two fittings together by threading. They should thread easily and a wrench should be used only for tightening. Additionally, a straight length of rigid fuel line should not be made between two components or fitting rigidly mounted to the airframe. A small bend is needed to absorb any strain from vibration or expansion and contraction due to temperature changes. 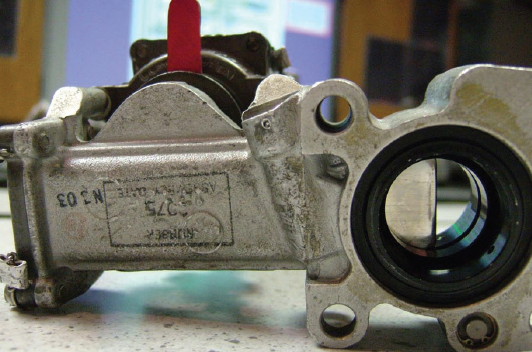 There are many fuel valve uses in aircraft fuel systems. They are used to shut off fuel flow or to route the fuel to a desired location. 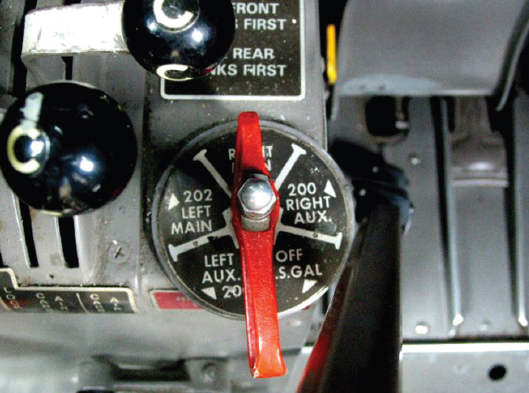 Other than sump drain valves, light aircraft fuel systems may include only one valve, the selector valve. It incorporates the shutoff and selection features into a single valve. Large aircraft fuel systems have numerous valves. Most simply open and close and are know by different names related to their location and function in the fuel system (e.g., shutoff valve, transfer valve, crossfeed valve). Fuel valves can be manually operated, solenoid operated, or operated by electric motor. This motor-operated gate valve has a red position indicating lever that can be used by maintenance personnel to identify the position of the valve. The lever can be moved by the technician to position the valve. 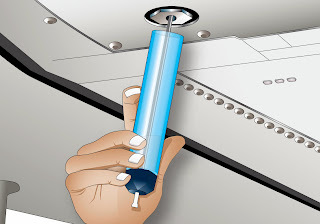 Other than aircraft with gravity-feed fuel systems, all aircraft have at least one fuel pump to deliver clean fuel under pressure to the fuel metering device for each engine. Engine-driven pumps are the primary delivery device. Auxiliary pumps are used on many aircraft as well. Sometimes known as booster pumps or boost pumps, auxiliary pumps are used to provide fuel under positive pressure to the engine-driven pump and during starting when the engine-driven pump is not yet up to speed for sufficient fuel delivery. They are also used to back up the engine-driven pump during takeoff and at high altitude to guard against vapor lock. On many large aircraft, boost pumps are used to move fuel from one tank to another. There are many different types of auxiliary fuel pumps in use. Most are electrically operated, but some hand-operated pumps are found on older aircraft. 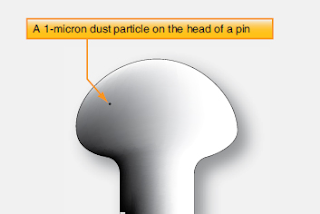 Size comparison of 1-micron dust particle and pin head. Turbine powered aircraft operate at high altitude where the temperature is very low. As the fuel in the fuel tanks cools, water in the fuel condenses and freezes. It may form ice crystals in the tank or as the fuel/water solution slows and contacts the cool filter element on its way through fuel filter to the engine(s). The formation of ice on the filter element blocks the flow of fuel through the filter. A valve in the filter unit bypasses unfiltered fuel when this occurs. Fuel heaters are used to warm the fuel so that ice does not form. These heat exchanger units also heat the fuel sufficiently to melt any ice that has already formed. The most common types of fuel heaters are air/fuel heaters and oil/fuel heaters. An air/fuel heater uses warm compressor bleed air to heat the fuel. An oil/fuel exchanger heats the fuel with hot engine oil. This latter type is often referred to as a fuel-cooled oil cooler (FCOC). Note that some aircraft have a hydraulic fluid cooler in one of the aircraft fuel tanks. The fluid helps warm the fuel as it cools in this type of full-time heat exchanger. 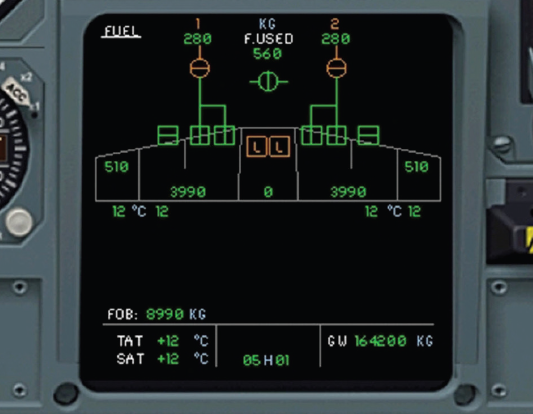 Aircraft fuel systems utilize various indicators. 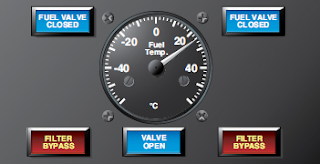 All systems are required to have some sort of fuel quantity indicator. 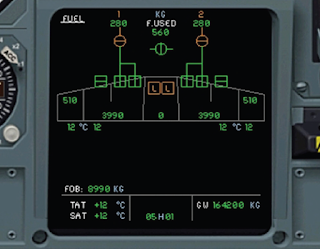 Fuel flow, pressure, and temperature are monitored on many aircraft. Valve position indicators and various warning lights and annunciations are also used.